The first step in understanding cavitation is realizing that the term simply refers to the formation of a cavity (sometimes referred to as a “bubble” or “void”) within a solid object or liquid body. However, what causes the formation and what is contained within the cavity is not always the same. Cavitation may fall under one of two categories: vaporous or gaseous. The introductory example of pump erosion damage is due to vaporous cavitation. This occurs when the fluid pressure drops below the vapour pressure and allows local regions within the fluid to rupture. As soon as the saturated vapour pressure is reached, a local phase change occurs causing many small bubbles (or “cavities”) to be instantaneously created, similar to boiling. To demonstrate this phenomenon, let’s explore the engine oil pump example in more detail. The engine oil pumps are a positive displacement design, which create a pressure drop on the inlet/suction side, causing engine oil at atmospheric pressure to flow from the sump. Vaporous cavitation can occur during the oil suction process. During this process, the velocity of the oil in the suction tube increases with engine speed. The combination of high velocity with high oil temperature creates favorable conditions for cavitation. The damage occurs when the fluid pressure increases above the vapour pressure, as the oil is compressed by the pump. Once the vapour cavities are exposed to higher pressures, they collapse on themselves. The rate of collapse can be over 100 m/s, resulting in the generation of shock waves. When these shock waves repeatedly occur close to surfaces, the surface will eventually become damaged (pitting will be seen). With continued vaporous cavitation, significant loss of material and bearing stress will ultimately lead to component failure. To recap in simple terms, vaporous cavitation produces bubbles as a result of a liquid-to-vapor phase change. Gaseous cavitation produces bubbles of gas components that were previously dissolved in the liquid medium. This occurs when the pressure falls below the saturation pressure of the non-condensable gas dissolved in the liquid. As pressures and temperatures fluctuate in a hydraulic system, the fluid will absorb gas or release dissolved gases to main this equilibrium. The release process is gaseous cavitation. It’s important to understand that the bubbles are not a result of a phase change. Unlike vaporous cavitation, there is no final gas-to-liquid phase change. Thus, the material erosion caused when vapor bubbles violently collapse does not occur with gaseous cavitation. It is important to understand that aeration and cavitation are not the same thing, but a relationship exists between them. Aeration simply refers to a presence of air in a liquid. Vaporous cavitation is not related to aeration. Again, the bubbles created by this process are simply a liquid-to-vapor phase change—they do not contain any air. Gaseous cavitation bubbles, however, may contain air. We can return to our engine oil pump example to demonstrate the concept. 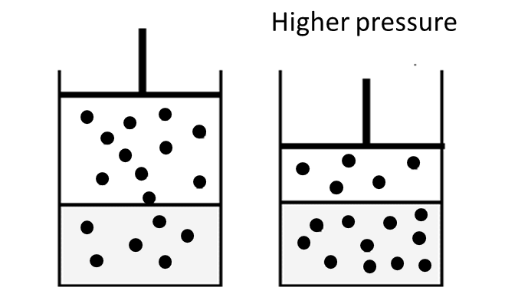 If free air in the crankcase becomes bound to the oil (by agitation, for example), the resulting entrained air bubbles may be unable to escape before reaching the suction inlet of the oil pump. These air bubbles will diffuse into the oil due to the higher pressure on the discharge outlet. As the pressure drops through the oil galleries and return to the sump, the air bubbles will re-emerge through the process of gaseous cavitation. Cavitation of the vaporous-kind receives the attention as the cause of material erosion and failure of pumps, propellers and control valves. However, the relationship between gaseous cavitation and aeration poses a significant risk to hydraulic actuation and lubrication systems. At a high level, gaseous cavitation can generate noise, high temperatures and oxidation of the fluid. 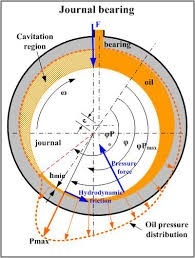 In an engine, the amount of air in the oil can reach levels where the load carrying components, such as the crank journal bearings, do not have enough hydrodynamic film thickness to support the engine load. In this case, it is possible to see gaseous cavitation create a touch condition of the soft journals that will lead to rapid wear and heat build-up. intake valves from reaching their full stroke and may retard valve timing, both of which affect engine power and exhaust emissions. Despite the difference between vaporous and gaseous cavitation, the design and operating parameters of a given hydraulic system have a significant impact on both types of cavitation. In the cause of engines, the design of the suction tube, inlet pressure, temperature and flow rate all influence the potential for cavitation to occur. Lower oil temperature, increased inlet pressure and lower engine RPMs will reduce vaporous cavitation. Gaseous cavitation may be best reduced by controlling oil aeration levels. Improving conditions for air release (i.e. maintaining lower RPMs to increase residence time, lower viscosity, lubricant additives) will help prevent excess entrained air from becoming dissolved in the first place. Ultimately, the complete design of the engine lubrication system (i.e. suction tube, oil sump windage tray, galleries, etc.) plays a leading role in managing cavitation. Enter your email to receive a copy of our eBook on aeration. Miranda, G. D. C. (2016). The Detection of Journal Bearing Cavitation with Use of Ultrasound Technology (Doctoral dissertation, Case Western Reserve University). Rudnick, L. R. (2017). Foaming Chemistry and Physics. In Lubricant additives chemistry and applications. Boca Raton: CRC Press, Taylor & Francis Group. Subscribe for the latest testing news and updates.